I think an alternate term for art of the 1600s is needed other than “Baroque.” Baroque is the established stylistic term for the period roughly 1600–1750 in Western art. The term comes from the word “barocco,” a Portuguese word for an irregular pearl. 1800s critics coined the term to disparage—what they considered—the unstructured, over-ornamented, theatrical, and grotesque art of the post-Renaissance period with its “clarity, serenity, and balance” (ugh). Okay, so we get it, Baroque art was more dramatic than that of the Renaissance. Nowadays, the term “baroque” is used to characterize anything a little over the top, be it an outfit, wallpaper, interior design, or even an artfully-presented meal. If “drama” is one of the criteria of “baroque,” then have I got it for you in art of the 1600s outside of the West: Japan. During the Kamakura (1185–1333) and Muromachi (1392–1573) periods, Japanese painting was heavily influenced by Chinese subject matter, and the scholarly landscape style. After the establishment of a military dictatorship during the Momoyama (1573–1615) period, which lasted through the Edo Period (1615–1868), Japan’s isolationist, no-foreigners-allowed policy fostered a more insular culture that revived interest in indigenous Japanese-style painting. A prevalent vein was a very decorative style that emphasized surface, rich use of gold leaf, and flatness of form. Many subjects were based on Japanese literature and poetry of the Heian (794–1185) period, and poetic allusions to nature and the four seasons. Kitagawa was part of the so-called Rinpa (Rin painting) painters, a term based on the name of Ogata Korin (1658–1714), a sort of stylistic leader of the “school” (although none actually existed, school in painting usually refers to a group of artists who work in a similar style or subject matter). 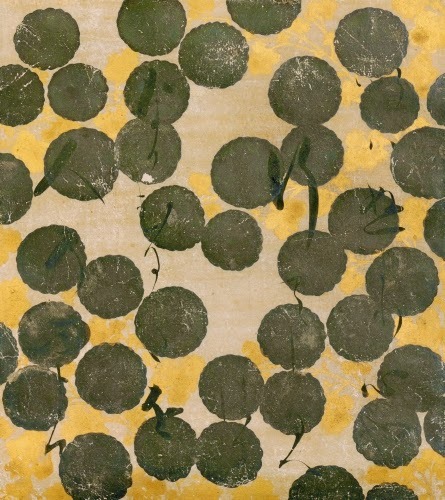 Like Ogata, Kitagawa emphasized bold forms with a disregard for naturalism of setting. He is most renowned for his depictions of flowers that are symbolic of the seasons. 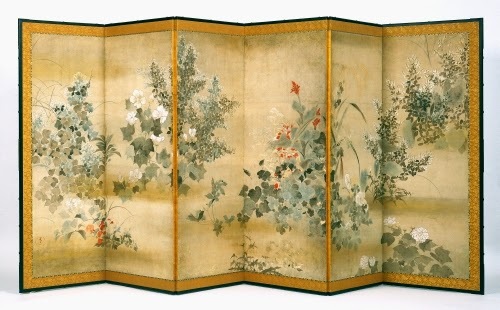 This screen, used to section rooms in Japanese homes, has dramatically large groups of plantings in an asymmetrical, arcing diagonal composition (a typical Kitagawa device). There is very little if any reference to surrounding nature, thus thrusting the composition into even greater dramatic display. The red-flowering grasses (susuki) are particularly symbolic of autumn (the red of the autumn equinox). I’m not quite sure why the other plants symbolize autumn, but the composition certainly invites the viewer’s eyes to follow its movement across the screen. There is also ivy (which symbolizes faithfulness or endurance), mallow (obsessive love), and cockscomb (absurdity). Hon’ami was the most renowned calligrapher of his time that collaborated with many painters. Tawaraya was thought to be the father or mentor of Kitagawa Sosetsu. Both Hon’ami and Tawaraya were pivotal in the evolution of Rinpa art. What could be more stunningly beautiful than Hon’ami’s exuberant, slashing cursive Japanese against a bold background of chrysanthemum blossoms?! Dramatic birds-eye view and brilliant color contrasting with gold and silver leaf places this painting high on my exuberance level. It is also indicative of the reverence for indigenous Japanese subjects of this period. The Soga Brothers’ (Jurō and Gurō) story was made popular during the Heian period, and was retold in many later versions, becoming particularly popular in Kabuki theater during the Edo period. 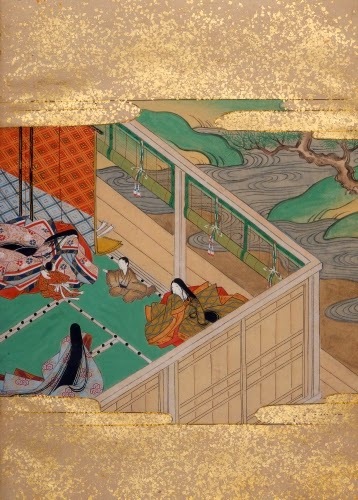 This mourning scene, in which the women are dressed in the Heian court style, may refer to the Jurō’s of Kudō Suketsune, the killer of the Soga Brothers’ father, and a retainer of the shogun. 1600s After moving the Iranian capital to Isfahan (1590s), Shah Abbas (1571–1629) initiated a building program to make it a glittering city, the largest program ever undertaken by an Iranian ruler. Isfahan is famous for its beautiful public buildings with decorative ceramic tile facades. 1600–1700s Nearly 250,000 slaves from West Africa were brought to America. Although forced to do agricultural labor, their presence in the colonies started an enduring contribution to the arts in the developing country: ceramics, textiles, woodworking, and basketry that were produced for others. 1615 Beginning of the Edo (Tokugawa) period in Japan. A time of isolation until 1868, Japanese painting and printmaking flourished, calling on indigenous styles and culture as inspiration. 1644 Beginning of the Qing Dynasty in China. Chinese art was a major export item to the West during this period (until 1912), particularly porcelain, silk, and painting. 1680 Pueblo bands united and expelled the Spanish from New Mexico for a dozen years. They reestablished their indigenous faith traditions, reconsecrating kivas and reviving traditional arts such as kachina branded “heretical” by the Spanish. 1728 John Smibert (1688–1751, US, born Scotland) emigrated to the American colonies and became the seed artist of the American school of painting during the colonial period. Studio activity: Draw a baroque group of flowers. Using colored pencils or pastels, draw a group of imaginary flowers in bright colors and bright greens on black construction paper. If a specific light source is desired, create shadows by using darker hues of the main colors of the flowers and darker greens like viridian. In order to focus attention on the still life, ignore background details or a setting for the work. Use the lower edge of the construction paper as an imaginary ground out of which the flowers are growing.